Leaving the NIcholaikirche we walked along what seems to be the old town’s main shopping street, Grimmaische Strasse, to the Augustusplatz. Here we found plenty to keep our cameras occupied! Firstly, as we arrived at the end of Grimmaische Strasse there was an interesting monument to the demonstrations of 1989, although we found it hard to get decent photos of this. The Augustusplatz is the largest square in Leipzig, and one of the largest in Europe. It was also once considered one of the most beautiful, but most of the buildings surrounding it were destroyed in WW2 and it is now something of a hotchpotch, albeit with some attractive buildings and features. It has seen many name changes over the years. It started life in 1785 as the Platz vor dem Grimmaischen Thor but was renamed Augustusplatz in 1839 after Frederick Augustus, the first king of Saxony. In 1928 the city government renamed it Karl-Marx-Platz, although this name proved unpopular and was largely ignored. In 1933 the Nazis renamed it Augustusplatz, then in 1953 it became Karl-Marx-Platz again, and finally in 1990 (on the day of German reunification) it again returned to Augustusplatz. The 1960s-built opera house on the north side of the square was, like the Town Hall, undergoing some restoration work, but giant ducks installed in the fountain pool in front of it celebrated 325 years of opera in Leipzig. The trees around the square are sponsored, most in memory of a loved family member, as you see in many places (including our own local park in Ealing). One though stood out - it had been sponsored by fans of Michael Jackson, presumably after his death in 2009, and was marked with candles, flowers and cards to mark what would have been his 60th birthday on 29 August this year. On the south side of Augustusplatz is an impressive fountain, the Mendebrunnen, dating from 1886 – a rare remnant from the square’s past. And on the west side we couldn’t fail to notice what looked like a very striking modern church. I was surprised to see this, as I hadn’t read in my planning research of a modern church in the city. When we went to investigate all became clear. This is one of the main buildings of the university, the Paulinum, and stands on the site of the former university church, dedicated to St Paul, the Paulinerkircher. This formerly Dominican monastery church was blown up under orders from the GDR government, dynamited to make way for the redevelopment of the university, eventually carried out between 1973 and 1978. Protestors against the blasting operation were arrested. However enough warning was given for a number of artefacts to be saved - ancient tombstones, statues of saints, fragments of stained glass and frescoes from the cloister. These are all now displayed inside this university building and anyone can go in to view them, as we did. A rather sad sign explains that this is the tombstone of the five children of Tobias Möbius, three daughters and two sons, all of whom died between 1654 and 1660. Four died while still babies; only Maria Elizabeth, seen on the right, lived to the age of just four, although she is depicted here more like a young adult. Emerging on the far side of the building we found ourselves in a peaceful courtyard surrounded by the university’s lecture theatres, seminar rooms etc. A few students sat on benches here, and in one corner stood a statue of Gottfried Wilhelm Leibniz, the German mathematician and philosopher, who was born in Leipzig on 1 July 1646. We also had good views from here of the City-Hochhaus, and resolved to go up to its observation platform later in our visit, if the promised better weather materialised. 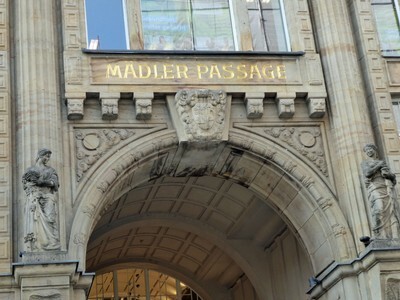 We walked back down Grimmaische Strasse, stopping off at the Mädlerpassage, a rather grand shopping arcade from the early 20th century, to take photos and make a reservation for dinner tonight at the historic Auerbachskeller – more about that later! By now it was mid-afternoon and we were peckish, having had nothing since that rather good breakfast. So we stopped off at the Café Kandler, near the Thomaskirche, for ‘Kaffe und Kuchen’ - raspberry and yoghurt cake for Chris, apple and poppy seed for me - both delicious! We then visited the church opposite, where no restrictions on photography were in evidence. The church is even more closely associated with Bach than the Nicholaikirche. He was music director here from 1723 until his death in 1750, and his remains (probably) lie in a tomb in the chancel. There has been a church on this site since the 12th century but the current building dates from 1496. Martin Luther preached here on Pentecost Sunday in 1539. The tower was added in 1537 and rebuilt in 1702. The Baroque interior was remodelled in the Gothic revival style in the late 19th, so the church is not as Bach would have known it and very little remains from the composer’s time here. Other composers also associated with the Thomaskirche include Mozart, who played the organ here in May 1789, and Wagner, who was baptised here in August 1813 and later studied piano here. Someone was playing the organ, which added atmosphere to our visit, although this is not the organ Bach would have played, as that one was removed during the 1880s renovations. We visited a small exhibition in a side chapel with old bibles, church service books and musical instruments from Bach’s day. In the main part of the church I admired the stained glass, and was surprised to note that the structure seems slightly kinked, with the choir area not completely aligned with the aisle. Does it look kinked to you? I was especially taken by an epitaph on the wall just to the left of Bach’s grave. This is dedicated to Daniel Leicher, a town councillor who died in 1612. The stone carving on the lower part (in my photo right) depicts the Old Testament story of Leicher's namesake Daniel in the lions' den. Back outside we took photos of Bach’s statue and of the church itself. At first I wasn’t sure whether to have a meal at the Auerbachskeller, as I felt its fame might make it too touristy, or that the food might be disappointing if they rested on their laurels and relied too much on the story behind the restaurant / wine bar to drive trade. That story goes way back. There has been a wine bar on this site since the 15th century – the first mention of it is in 1438. By the 16th century it had been incorporated into the Auerbachs Hof, a trade fair building complex, which was erected around 1530 at the bidding of Heinrich Stromer (1482–1542), a city councillor, professor of medicine, and rector of Leipzig University. He was popularly known as Doctor Auerbach after his birthplace, the town of Auerbach. The wine bar which he reopened in the basement of his new complex soon adopted his name – the Auerbachskeller. But the bar is famous not so much for its age as for one famous drinker here. When Goethe was studying at Leipzig University, from 1765 to 1768, he came here often, calling it his favourite wine bar. Here he saw two paintings – one showing the legendary magician and astrologer Johann Georg Faust drinking with students, and the other showing him riding out of the door astride a wine barrel, something he could only have managed to do with the assistance of the Devil. Goethe would already have been familiar with the Faust story (a Faust puppet show was regular entertainment at local street fairs) but he credited the Auerbachskeller with inspiring him to revive the legend and even featured it in the scene ‘Auerbach’s Cellar in Leipzig’, in which Mephistopheles performs a trick, bringing forth wine from a table in which he has drilled holes. When the medieval Auerbachs Hof was demolished around the turn of the 20th century, the Mädlerpassage was built in its place (1912-1913), again incorporating the Auerbachskeller, albeit rebuilt and expanded. Two sculptures now mark the entrance – one depicting Mephistopheles and Faust, and the other the Bewitched Students from the drinking scene. But what of our visit? Was I right to be cautious about dining here? Not at all! When we arrived at the Auerbachskeller it was buzzing, so we were glad we had made that reservation. We were even more glad after our very good meal of tomato soup with mushrooms (which we both chose to start with), perch in a creamy sauce with grapes and Savoy cabbage (me) and mixed meat strips in dark beer sauce (Chris). Talking of dark beer, the Schwarzbier I had with my meal was excellent, while Chris enjoyed another local pils, the Radeberger. And to finish we just had to have Radeberger Bitter again as a digestif! After our meal we had a little stroll. A very good string trio were playing in the Naschmarkt and had gathered quite a crowd, so we stopped to listen for a bit. We rewarded them with a few Euros after I had shot some video - mainly to capture their playing. I apologise for the picture quality – I was forced to take only my compact camera on this trip, as my broken arm couldn’t cope with the weight of my main one! We walked over to the Nicholaikirchhof as a friend had told me that some of the cobbles were prettily lit up at night, but they were in darkness (the same friend later found out for me that the lights were off due to maintenance – click here) to see what we should have seen. So we called it a night and headed back to the hotel through the city streets, very pleased with our first full day in Leipzig. Thanks Rosalie. The other bench is Bologna but it hasn't reproduced clearly here. lol Golo - these must be quite a lot bigger than she is! I wonder what she'd make of giant ducks?! I loved the benches. What a nice idea. The ducks I could live without. Odd way to commemorate an opera . . . The cakes . . . YES. Hi Sally. Yes, I didn’t really get the connection between the ducks and opera, except that they had an empty pool in front of the opera house and it all looked a bit dull with the latter under wraps. But Don has asked if he can use my photo of them in a future blog on opera in Leipzig, so maybe he will be able to make the connection The cakes were indeed excellent! I'll ask around, but my take on the ducks so far is that they are just there to celebrate the 350th anniversary in a funny and unpretentious way.